Can You Afford Good Communication? 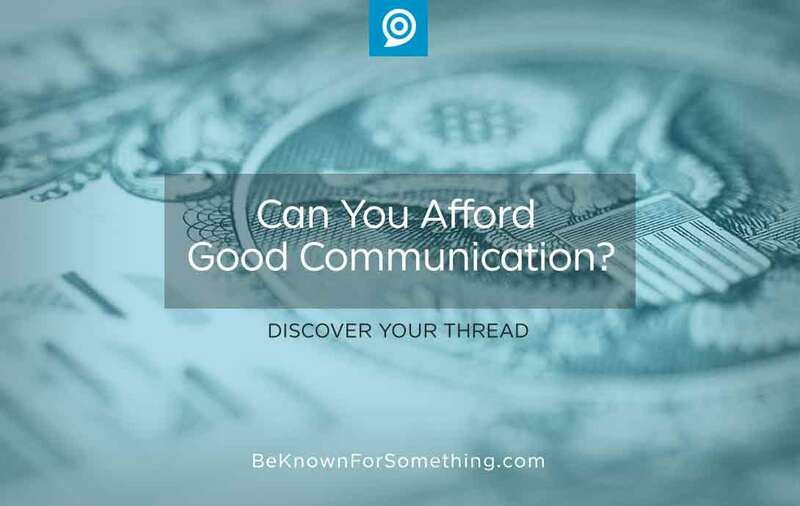 Be Known for Something : Discover Your Church Communication Thread / Communication Strategy / Can You Afford Good Communication? Autumn is upon us and many start thinking about Christmas shopping. I just heard a statistic that a million Americans are done with their shopping already. That sounds ridiculous! Or maybe you’re one of them? What do I need? Every church is different, but every church needs to address communication. What do you need though? You need to ensure that everyone in your church has the ability to find out what’s going on, when it’s going to happen, and where to be. Plus your external community needs to discover who you are, why you exist, and why they need to pay attention to what you’re doing (if they want to). Today, that foundation requires a simple, organized, current website (and most churches still need a simple printed bulletin too). And you probably also need an email system for regular contact; and/or a social media page that connects people to the website. In order for this all to work properly, you’ll need a person who coordinates your event calendar and the content (words, images and/or video). There are dozens of other communication tools that can be added based upon your needs. Can I afford it? Imagine a world where everyone knows what’s going on in your ministry with your community understanding why they need to know about you. That you actually have a benefit for them! They identify with you and want to attend your services. What is that worth to you? You need to invest “something” towards communication. You may not be able to hire a church communication company like ours but you can hire (or appoint) a person who knows communication strategy or ask a volunteer to start figuring out what specifically is needed and how much to allocate. You really can’t get away without a specific line-item for communication in your budget. Unless you want to plateau or decline. People need to know about your ministries. Will They Like it? Yes. People want to be in the know. They want to be proud of who you are and what you’re known for. It’s the power of good branding. If they’re giving money to a ministry, they deserve to have the communication. When you deliver the content to them in the right place, at the right time, they will be VERY happy. Ultimately, you can afford something towards keeping people happy. Just ensure that everything’s organized under a strategy and a process so you’re not wasting good money. There’s nothing worse than throwing money away in a church.